Tattoo removal creams contain skin-lightening ingredients like hydroquinone. 2 What Are the Main Ingredients of Tattoo Removal Creams? If you have a tattoo that you want to remove, you may wish to try a tattoo removal cream first. 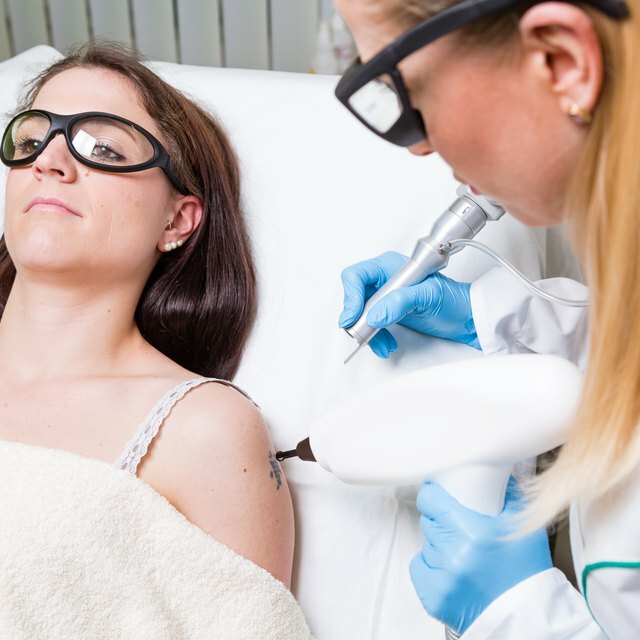 Laser treatment, the most widely accepted method of tattoo removal, is expensive and painful. However, the cream may not produce the same results as lasers or other medical methods of removal. A professional tattoo artist uses a specially designed tattoo machine featuring a cluster of needles attached to an electric power supply. A tattoo machine allows the artist to inject ink into the dermis, or the deepest layers of the skin, which shed cells much slower than surface skin. This is why tattoos are permanent, and why lasers that penetrate beneath the epidermis are generally required to remove them. According to the American Academy of Dermatology, amateur tattoos are frequently created by forcing different concentrations of India ink under the skin with a needle at varied depths. Blue and black tattoos are the easiest to remove, while yellow and green are the most difficult. Tattoo removal creams contain one of two ingredients: hydroquinine or salicylic acid. Hydroquinone is a type of phenol, and phenols in higher concentrations are used for deep chemical peels. Some manufacturers of hydroquinone-based systems claim their products can reach the dermis, although MayoClinic.com states that lotions cannot in fact penetrate that deeply into the skin. Salicylic acid is a mild exfoliant that breaks apart the lipids that hold dead surface skin cells together. One cream on the market contains arbutin, also known as bearberry extract, a skin lightener chemically similar to hydroquinone. Because tattoo removal creams can cause skin irritation, they are often full of moisturizers to help combat it. Soothing ingredients include mineral oil, petrolatum, aloe and dimethicone, a type of silicone. Shea butter and oils from plants and botanicals such as lemon peel, lavender, tea tree and rosemary leaf round out the soothing ingredients found in tattoo removal creams. Controversial ingredients in tattoo removal creams include parabens, which may disrupt estrogen levels and which the U.S. Food and Drug Administration reports have been found in breast tumors. Other creams contain kojic acid, which an investigation by the European Scientific Committee on Consumer Products found may be potentially damaging to DNA and therefore harmful to the user. If you experience troublesome skin irritation from a tattoo removal cream, read the ingredient list and look up the side effects of any you don't recognize. Different creams contain different potentially toxic ingredients. The three widely used methods of medical tattoo removal are laser surgery, dermabrasion and excision surgery. Surgical excision may work for very small tattoos, but is not meant for removing large pieces. Dermabrasion involves the use of a high-speed rotary abrasive device. According to MayoClinic.com, Q-switched lasers applied after injection of a local anesthetic are the preferred method of removing a tattoo. Lasers heat and shatter the tattoo ink, which is then absorbed into the bloodstream and excreted from the body. Tattoos with many colors may require treatment with various lasers of different wavelengths. MayoClinic.com: Does Tattoo Removal Cream Really Work?